Exciting crochet patterns for beginners to create right now! Crochet This Lacy Top For Spring	One-Skein Crochet Wonders! Learning to crochet will open up a world of creativity, and I Like Crochet is here to help! We have a wonderful collection of beginner patterns that will help you develop skills as you become comfortable with the craft. Create beautiful things as you discover the joy of crochet! Why not practice your stitches on the Moonlit Shells Shawl? The simplicity of this shawl is deceiving because it looks like a complex work of art! Moonlit Shells is designed by I Like Crochet favorite, Jennifer E. Ryan, and it’s just the thing to brighten up your little black dress. Jennifer combines two simple stitches, double crochet shell clusters and chains, to create an openwork wrap that appears much more complex than it is. The combination of DK-weight yarn and a large hook (size K!) gives this shawl gorgeous drape and airiness; the key to this is the chain work between the shell clusters. The open nature of the stitch pattern lends itself to all sorts of wardrobe choices, from sun dresses to winter wear, casual to fancy. Speaking of fancy, Jennifer gilded the lily on this one, adding teardrop beads to the picot points all around the edging of the shawl. This beautiful detail makes Moonlit Shells perfectly appropriate for a bridal shawl. Work it up in white with iridescent beads and present it with pride to the bride. What an amazing gift. Consider the Moonlit Shells Shawl if you’re a beginning crocheter; you’ll use stitches you already know, put them together creatively, and end up with a fabulous finished piece. It’s a great first-shawl project! An easy repeat pattern makes the Honey Spice Scarf a breeze to crochet! Blocks of color make up this shawl, so it’s easily customizable—go bright or subtle, regal or neutral. Scarves are the ultimate skill-building projects because you generally practice the same stitches over and over as you complete the piece. Here you’ll use double and single crochet stitches to create an easy lace pattern. With its color and texture, this scarf is simply the perfect accessory. 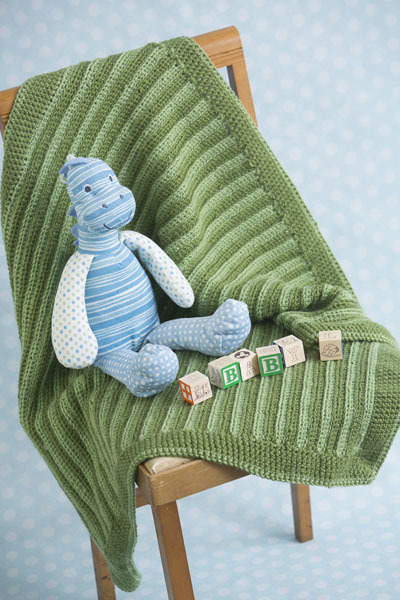 Beginners rejoice—this “babyghan” pattern is perfect for all skill levels. Using just two simple stitches and alternating colors, the Modern Stripes Babyghan works up quickly and makes a perfect gift for any newborn. Switch up the colors to create a different gender-neutral design, or go towards blue and pink to get gender-specific. You’ll work stitches into the back loop, create a border, and use the half double crochet stitch. Stretch your skills with this beauty. Did you know you can crochet jewelry? This easy, yet eye-catching piece, the Orchid and Chocolate Links Necklace, is created with simple single crochet and some basic jewelry supplies. Yes, you can make this beautiful necklace! Brighten up your holiday home with the Sweet Candy Cane Wreath! Not only is this a cute, bright Christmas décor item, it’s a wonderful introduction to colorwork and working stripes. What a fun way to learn a new skill! The Double-Ended Crochet Potholders pattern is a great introduction to double-ended crochet. 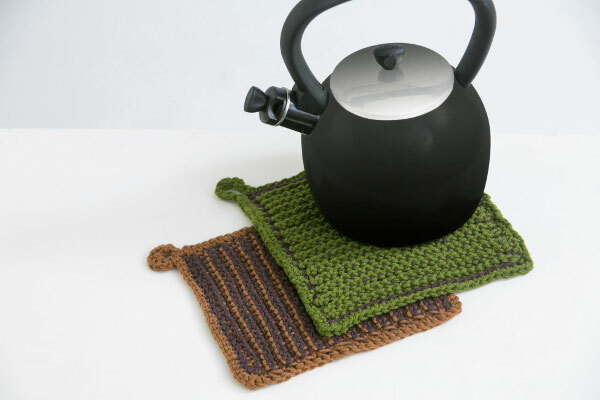 The beauty of the double-ended technique lies in its thickness—each potholder is dense enough to double as a hotpad. 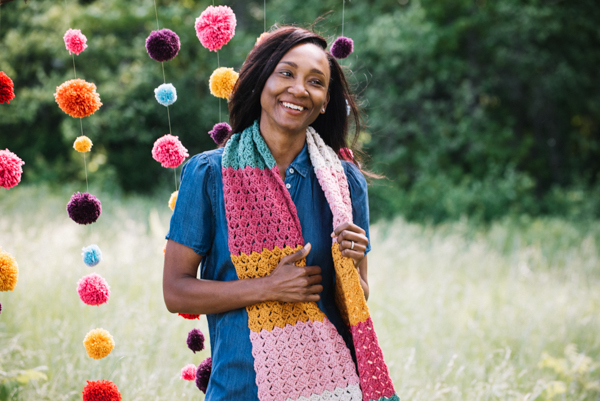 We want you to love crochet, and our beginner patterns and tutorials can help you become a better crocheter with each project you complete. So pick up your hook and yarn and spend some time crocheting with us!